Ready to blast off and master the smartest CRM in real estate?! We’re hosting a 2-day hands-on intermediate training on April 15th and 16th, 2019 at the Denver Marriott Tech Center. We realize that in April, jumping on a plane and leaving town for a few days is a tricky proposition. 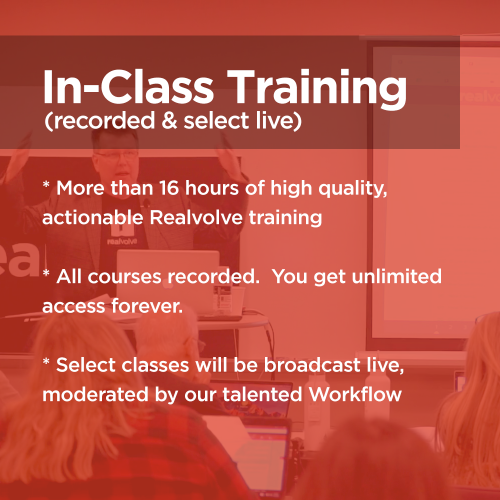 Sign up here and you’ll receive private access to the recorded classes that often take many useful turns as other Realvolver users ask incredibly valuable questions. Also as a bonus, we will announce several select classes that we’ll be broadcasting live, offering you an opportunity to ask questions that will be answered and moderated by our talented workflow strategists! Realvolve is the new standard for real estate technology. Our software-as-a-service blends elegant design, emerging technologies, and practical, thoughtful features. Real estate is all about people. Realvolve keeps you connected.